The areas most susceptible to creep damage in high pressure pipework systems are, as in headers, the welds. 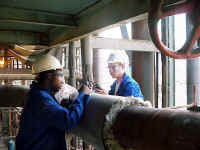 However, whereas in headers the stresses are generally determined by the pressure and thermal stresses alone, which are known or can be calculated, pipe work systems are also subject to highly variable and largely unquantified external forces. This means that life management procedures for welds have remained largely experience based despite a great deal of effort expended in trying to devise quantitative prediction procedures. 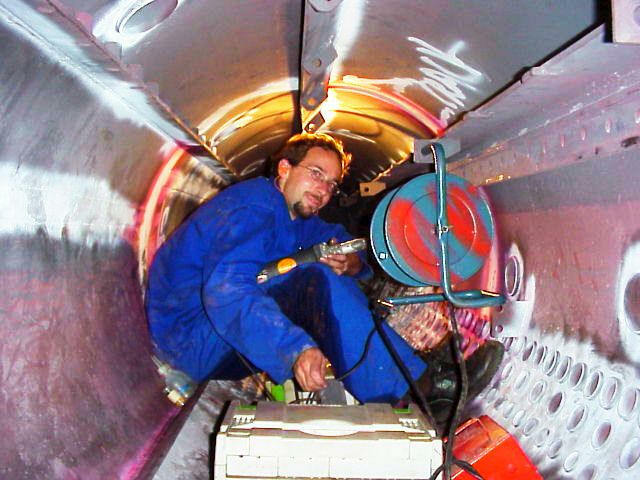 Qualitative assessment of the severity of creep cavitation through examination of surface replicas is frequently used for pipe weld life management. For operation beyond design life the condition of the parent material also has to be determined. Obtaining material for this is not a problem but the huge number of heats and individual forgings and castings in a typical system presents difficulties. Attention may then be concentrated on critical components within the system such as T-pieces and, in particular, bends. The latter are more highly stressed than straight pipes because of thinning and ovality produced during the bending process as well as the greater potential for stresses generated by system forces. Experience has confirmed the analytical prediction that outer surfaces are the most susceptible to creep damage. Methods which have been examined for quantification of the damage include the usual metallographic surface replication techniques as well as ultrasonic, magnetic based techniques.